At the last Winter NAMM show, L.R. Baggs introduced a quartet of pedals that aimed to cover all the bases for a typical acoustic gig. At the last Winter NAMM show, L.R. Baggs introduced a quartet of pedals that aimed to cover all the bases for a typical acoustic gig. The Reverb pedal is a simple, no-nonsense ’verb that combines beautiful ambient-flavored tones with more conservative sounds. 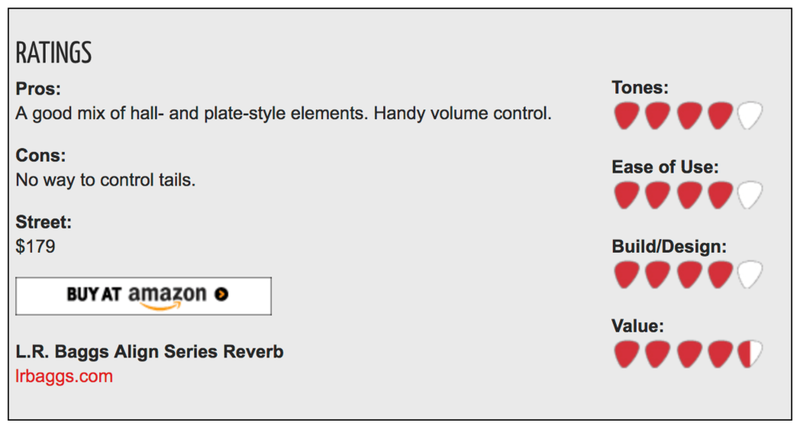 The control set covers volume, tone, reverb (or mix), and decay. With my Cordoba acoustic, I plugged the Align Reverb straight into a Fishman Aura DI and a Fishman SA220 PA system. To start, I kept all knobs at noon and the result was a healthy, spacious room sound that felt a little glassier that a typical hall reverb. Not quite a plate-style, but by increasing the decay you can get close. The reverb knob definitely had a sweet spot in terms of the mix. I found that keeping it between 10 o’clock and 1 o’clock gave me a nice balance. A big plus was that at even the highest levels the dry signal was never washed out. Decay controls can sometimes be dicey—either too subtle or not effective enough. L.R. Baggs did an admirable job by placing the sweep where you can really move between some distinct flavors simply by moving this knob alone. Rarely do you find a pedal that’s so in-tune (pun intended) with the needs of a working acoustic guitarist. If you need a general reverb solution that fits your acoustic side, the Align series is definitely worth a look.